The EITCI Institute's Certification programmes constitute internationally recognized IT competencies and skills formal confirmation standard originated in the European Union. This standard is commercially and non-commercially disseminated both in the EU and abroad (with over 1 million of Certifications issued since 2008). 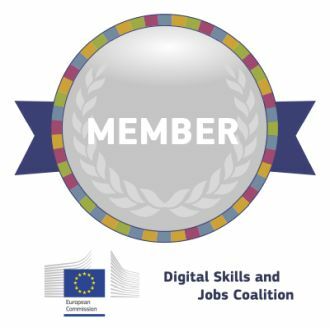 The EITC/EITCA certification is the European Commision's Digital Agenda for Europe implementation regarding strategic for information society IT skills confirmation framework, disseminated within the ERDF fund support. More details on the EITC/EITCA certification framework can be found on the How it works? EITCA Academy page. The EITCI Institute's Certification Curriculums' didactic content is prepared in cooperation with academic and industrial IT experts in relevant areas to their specializations. EITCI Institute cooperates with IT staff of high-profile companies and with acknowledged academics and educators. International IT experts already associated within the EITCI Institute or invited to cooperation due to their experience and projects are defining and authoring didactic contents related to existing or newly proposed EITCI Certification Curriculums. Proposals of novel EITC/EITCA Curriculums are subject to the EITCI Institute's panel evaluation and detailed programming within the Certification Commission and upon positive evaluation the novel EITCI Certification Curriculum is defined and iteratively updated with relevant corrections to undergo the accreditation process. Each accredited EITC Certification consists of approximately 15 hours of programme, usually split in 10 hours of lectures and 5 hours of assignments of the programme coverage within the related didactic content, as well as of the relevant remote examination materials. The EITCA Certification groups certain well defined sets of EITC Certifications in area of professional specialization. All authors or co-authors of the EITC Certification Curriculums related didactic contents are invited for membership in the EITCI Institute as experts in their relevant fields with exemption from membership fees. If you would like to apply as an author of the EITCI Institute's Certification Curriculums related didactic content please either contact us or apply for Membership in the EITCI Institute, indicating that you are interested in involvement in EITC/EITCA Certification Curriculums didactic content definition and authoring. The EITCI Certification Related Content Licensing Agreement Terms and Conditions for the authors are available here. EITCI Institute cooperates with universities in the EU under the theme of the ECTS system (the European Credit Transfer and Accumulation System). Subject to bilateral agreements between EITCI and individual universities, the certain EITC/EITCA Certificaiton programmes are awarded with the ECTS points, thus enabling European students among Certification holders an acceptance of the learning that they underwent within their academic conduct. More detailed information can be found on the ECTS EITCA Academy webpage. The ECTS constitute European standard in comparing volume of learning based on learning outcomes (in case of EITC/EITCA Certification measured by the examination results) and associated workload upon higher education conduct across the European Union and cooperating ECTS countries. For earned EITC/EITCA Certification relevant ammount of the ECTS credits are awarded depending on the particular programme and the agreement with a particular university. If you are representing a university interested or inquired by the students for awarding of the ECTS points for relevant EITC/EITCA Certifications, please contact us. Programme (by delivering educational content for evaluation and accreditation by the EITCI Institute, thus expanding EITC/EITCA Certification programmes scopes). An institutional partner can commercialize EITCI Institute's Certification programmes upon licensing them (with commission fees varying between 25% and 50% of the Certification price depending on the model of the license) under accreditation of the EITCI Institute. Minimal reference prices of the EITCI Certification programmes (including B2B and B2G offers) are presented in the EITC/EITCA Brochure and at EITCI webpages. Also depending on the licensing model the didactic process can be implemented either by the accredited licensee or by the EITCI Institute, while the examination and certification processes are performed solely by the EITCI Institute. If you represent legal entity interested in cooperation with the EITCI Institute please contact us. If a potential partner is interested in cooperation with the EITCI Institute, EITCI Institute will perform accreditation of the partner granting it with a license for commercial dissemination of the EITCI Certification Programmes (details of cooperation are specified by the bilateral cooperation agreements between a partner and EITCI Institute). After such an agreement is settled EITCI Institute's experts support partner in deployment of the EITC/EITCA Certifications in terms of technology and all related processes. The EITCI Certification Licensee Accreditation Agreement Terms and Conditions are available here and apply to all cooperating EITCI Accredited Certification Licensees. If your institution is interested in Accreditation and Licensing of EITCI Certifications please contact us.